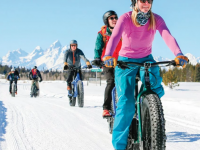 Many of you have asked for a regular info source with all the daily grooming for cross-country trails and fat biking around Jackson Hole and Teton Valley. 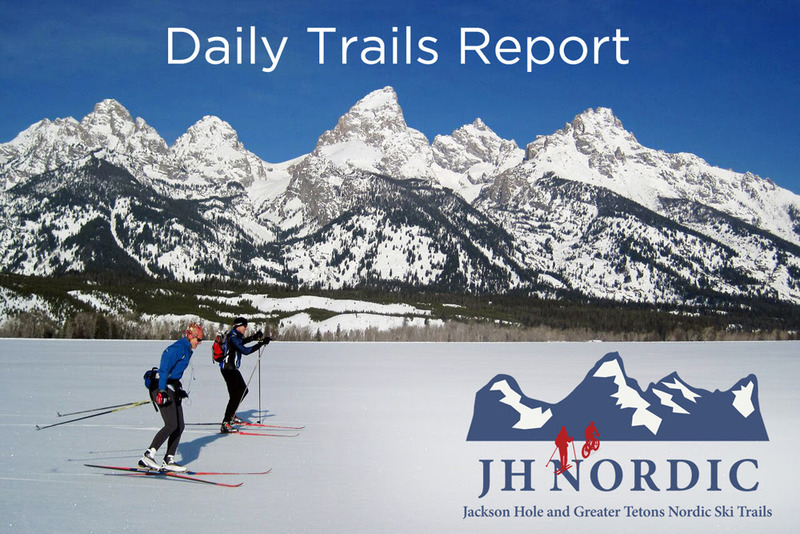 Thanks to support from the JH Travel & Tourism Board, The Jackson Hole Nordic Alliance now offers a daily email with all the latest grooming, events and programs. Check out a sample Daily Trails Report below. Sign-up on the Home Page. And as always, your feedback is most welcome!! Stay in touch from near and far with the latest trail report! Please forward this along to any nordic enthusiasts that might enjoy a daily local update. They can sign up by clicking on the button above. It appears that the inversion is hanging around in the valley still, keeping snow cold until the afternoon sun warms it up. Skiers at Skinny Skis reported excellent skiing at Turpin Meadows and Shooting Star yesterday. 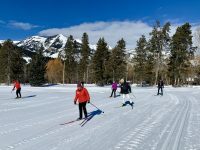 Teton County Parks and Rec will be grooming around town in Jackson today, a perfect day to get in a few laps on your lunch break! Patchy fog before noon. Otherwise, mostly sunny, with a high near 27. Calm wind becoming south southwest 5 to 7 mph in the afternoon. Then, patchy fog after midnight. Otherwise, mostly cloudy, with a low around 14. South wind 7 to 9 mph. Groomers Comments – Groomed the skate lanes late Wednesday night. Did not reset the classic track. It is ok but I will try to reset it in the morning. We are experimenting with the new tracked ATV for a week or so. There might be a bit of a learning curve here so please have patience while we work out the kinks. Groomers Comments – Heading out to roll the potatoes now (3:55 – Wednesday). Let it set up before using and it is sure to be in great shape when it does. Update: I made 3 passes. It was actually a bit more firm then I anticipated. All is good. Enjoy the track! Groomers Comments – I plan to groom skate track this morning, classic track is still in good shape from previous groom, should finish by 10am. Left single track as is but it looks good. While the sun is doing its best to beat back the morning’s frost, the battle has not yet been won. As of 10:45 AM the temperature was still a somewhat cool -11ºC/12ºF and even though the sky is definitely brightening, one would say that fog still prevails. 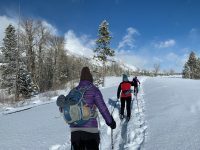 While one might say that the fog would bring a lugubrious nature to today’s Nordic outing, if the fantastical nature of the winter wonderland created by the outstanding frost formations is considered, then one’s ski journey would surely be a festive event and a great reason to come on out to Trail Creek today. Today’s grooming was a single pass with the Pisten Bully of the Moose Chase course. While most of the grooming focused on the skate lanes, the classic tracks were touched up in a few places. Some of the skate lanes were best lined while in some of the more open areas the focus was on widening the trails in preparation for the race. While the snow is becoming a bit tired, all in all it is holding well and skiing is good. Groomer’s choice for today is Homesite. Park Road groomed this morning! Skiing reported to be very good as of Tuesday afternoon. FREE – Thursday Feb 18 5:30 – 6:30pm with Toko Wax Tech Rep. Erich Wilbrecht. Erich will cover proper base prep and wax application for XC ski racing with a focus on getting skis ready for the Moose Chase marathon Saturday Feb 20. 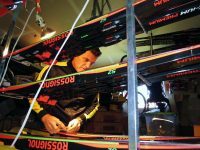 Erich was a member of the ’92 Winter Olympic team in biathlon and knows his stuff when it comes to making skis fast! or email scott@skinnyskis.com with any questions. The Jackson Hole Ski & Snowboard Club is proud to present the 24th Annual Moose Chase Nordic ski race at the Trail Creek Nordic Center. This premier Nordic race includes a 30k (that skis like a 50k), a 15k, 5k, 3k and a free 1/2k. Athletes can skate or classic ski the course. 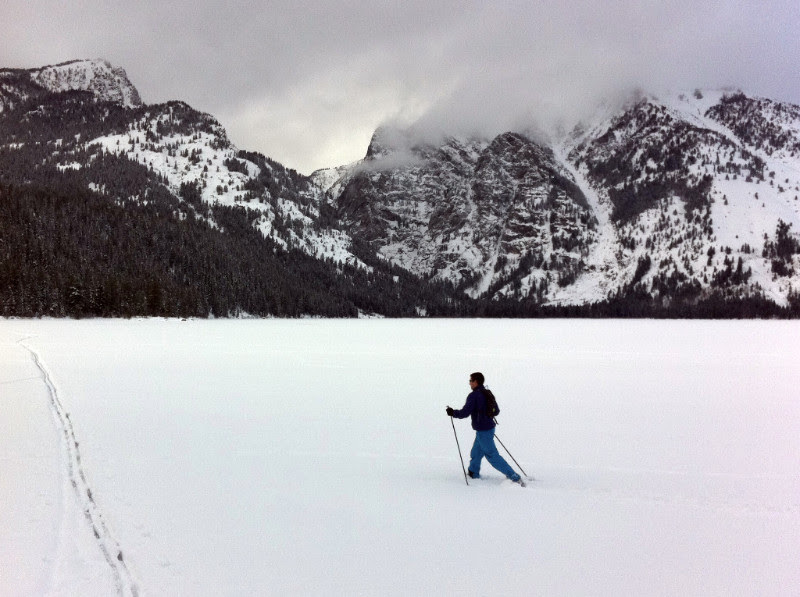 Biweekly grooming throughout the winter season in Grand Teton National Park is made possible by Grand Teton National Park Foundation. To support this community effort, visit www.gtnpf.org/donateand list “grooming” in the comments field.